I know many who are almost pros at this type of shopping. Spending hours a day, once or twice a week, driving to and fro, searching through other people’s junk slightly used items and ending up with many a hidden treasure! However, yard sales are not something that everyone is into. Some of us, myself once included, find that this type of shopping produces very little, if any, finds at all. I have searched many times past in hopes of finding that one potential gold mine. I have gotten the map out, circled all of the locations for that day, and then headed out the door – at least half a tank of gas ready and waiting for the travels ahead – just to be thoroughly disappointed with the less then suitable finds of the day. I was impatient. I didn’t give it enough time. I didn’t search through EVERY plastic tub that was in the driveway for that one item hidden amongst the rest. I had better things to do. Well, that was before this last summer. I have had such luck with yard sales this year that I have a new outlook on carelessly rummaging through other people’s things. And what has surprised me the most? Clothes. I have NEVER found so much slightly-used clothes that I would wear as I have this year. I don’t know if my style frame of mind has changed, or if the fashionable people of this town decided to let some of their nicer stuff go, but I have found that their to-get-rid-of has become my new-to-me wardrobe! 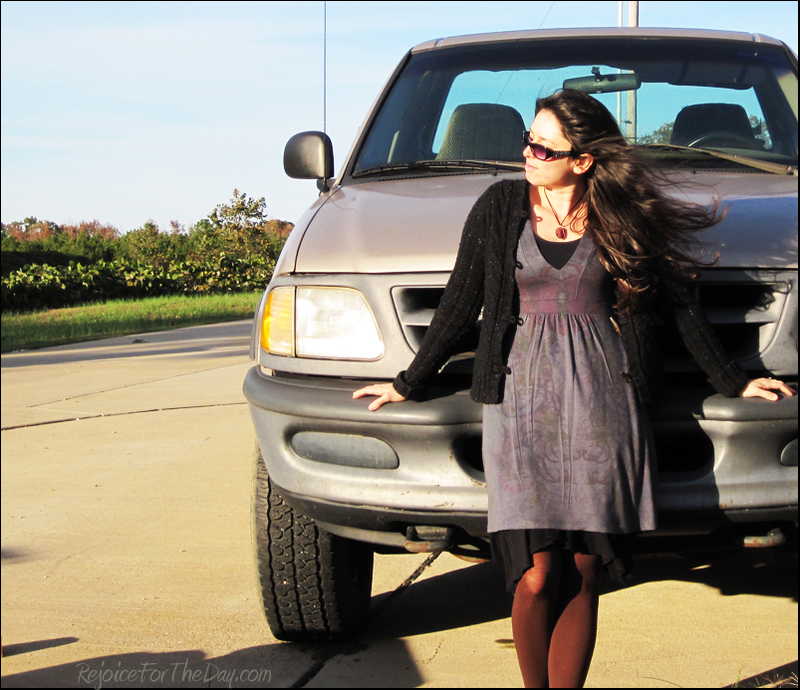 This is my first week of linking up with Coffeandcardigans.com’s Thrifter Thursdays. I have been wanting to link up for a while, and finally decided why not now. The rules of Thrifter Thursdays say to wear at least one thrifted item, but I am gonna go for as much thriftiness as I can get on. 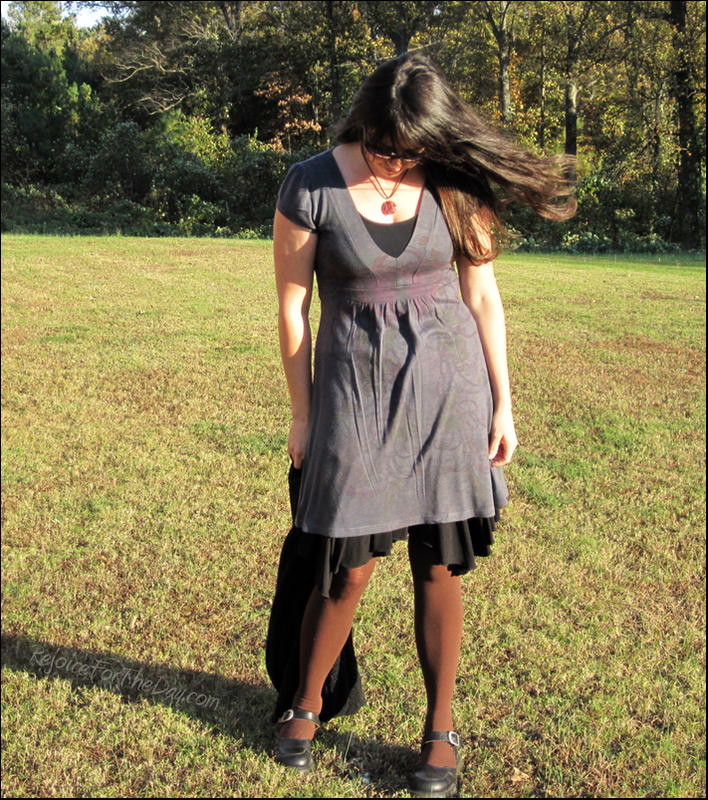 This week’s thrifty find was inspired from a yard sale success, and I almost passed the dress up. Wow, I have now managed to make my first post about thrifting clothes longer than usual. Thanks to those of you who have read through all of it! Like I said with my last clothing inspired series of Skirtember, I hope I don’t alienate or lose any of my regular readers. I do write about other things throughout the week – most of the time! Come back by next Thursday to see what I have to show from my thrifting world, or now you know when to stay away. Here are a couple of outfit pics I put together for this week. Maybe they will distract from all of the words! Thanks for info on Thrifter Thursday-sounds fun. I don’t do garage sales but love thrift stores. I also love to tell folks that comment on my clothing where I got it from. Some great things can be found in thrift stores! Thanks for stopping by. So glad that you finally link-up for Thrifter Thursday! You’re right that certain people have a special talent for bargain hunting. I wish I were one of them! Usually, I just rely on luck. I love the layering you did with this outfit – adorable and perfect for autumn. Thank you so much for linking up for Thrifter Thursday! the layered skirt really adds dimension to the outfit…and i especially like it with the cardigan! very cute 🙂 i have trouble usually at yard sales too…although i’m not entirely sure why. glad you’ve had so much luck lately! I sure hope my recent yard sale luck isn’t short lived. I have a feeling I will still do better at thrift stores though. Thanks for the comment! Super cute! I love how you’ve layered a skirt under a dress! Why, thanks! The dress was a bit too short for me otherwise.